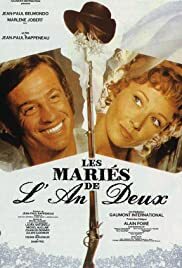 Jean-Paul Belmondo and Marlène Jobert star as a very memorable loving couple: In the beginning, we see them as children running through a snow-covered wood, teasing each other. Many years later, when husband Belmondo comes back from America to divorce his wife Jobert, they still act like children, who show their mutual affection by fighting, teasing and slapping each other. The relationship of our protagonists is mirrored by the incestuous and equally ardent love between a nobleman and his sister (played by the beautiful Laura Antonelli). Belmondo, certainly not a great actor, is perfect in this film, because he plays not a "hero", but someone who often can't act but simply has to react, with a blank and uncomprehending face, to the strange events that take place around him (for example, there is one scene in court where he is sentenced to death within minutes). I have seen this film many times and am still amazed by the sheer pace of it. The script is brilliant and one of its most beautiful features is the triptych-like structure (curiously, about at the same time Stanley Kubrick made his own triptych masterpiece "A Clockwork Orange"): First the prologue, then the first part leading to the centerpiece and climax of the film, then the third part being a mirror image of the first, dissolving with a stylish transition to the short and sweet epilogue, that in itself is a mirror image of the prologue: Although many years have passed, nothing has really changed. "Les Mariés de l'an II" is a poetic film about an endless childhood.